Modern computer technologies evolve with blazing speed. As we emerge into a new digital era, we tend to trust machines with virtually every aspect of our life. Development of secure network communication technologies opens new horizons of electronic business. However, it also plays a trick on our perception of the Internet. As we rely on secure technologies, we tend to neglect basic precautions. Let's look at Internet Explorer, the most popular web browser on the Net. On the one hand, starting with version 5, it offers a convenient AutoComplete feature, allowing you to enter your credentials once and let the program do the rest. On the other hand, though, Internet Explorer stores this information in an unprotected manner, which is a severe threat when we talk identity data. According to a Federal Trade Commission study, 27.3 million Americans have been victims of identity theft in the last five years! Holes in Internet Explorer software allowing 3rd party programs access to your private data surely help this number grow. So, is there a way to prevent identity theft? Yes! There is! Introducing Identity Knight: the unique credentials protection software that makes sure that no data from the IE AutoComplete list is left unprotected! 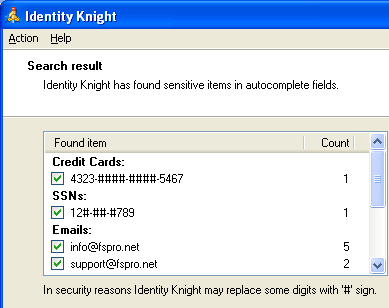 Identity Knight scans the IE AutoComplete data for credit card numbers, SSN, e-mails, postal addresses, and custom IDs. Once the application finds such information, it allows you to choose the data to secure. Thanks to advanced data scan technology, wildcards and regular expressions support, Identity Knight finds all kinds of identity data within seconds! Using the program is so easy that even a child could handle it. The step-by-step wizard interface ensures that you can easily control all the processes without difficulty. Multiple studies indicate that installing Identity Knight ensures optimum security settings for any kind of computing environment. Identity Knight is available now in a free trial version! So, go ahead and try it!